Address : 160 Hollis St. 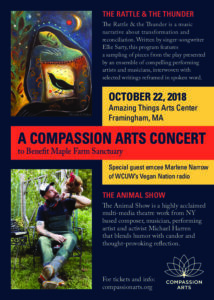 The event will be emceed by special guest Marlene Narrow of WCUW’s Vegan Nation radio, and all proceeds from ticket sales will go to the care of rescued animals at MFS. Tickets cost $20 online or can be purchased at the door for $25. Our featured performance, “The Animal Show” is a thought-provoking one-person multi-media show by Michael Harren, combining elements of classical composition with experimental electronics (in the genre of artists like Laurie Anderson, Peter Gabriel) accompanied by piano and string quartet. Through deeply moving storytelling and musical soundscapes, Harren takes the audience on a one-of-a-kind journey that blends humor with candor and reflection through which we are drawn to look at our relationships with other animals and ourselves. 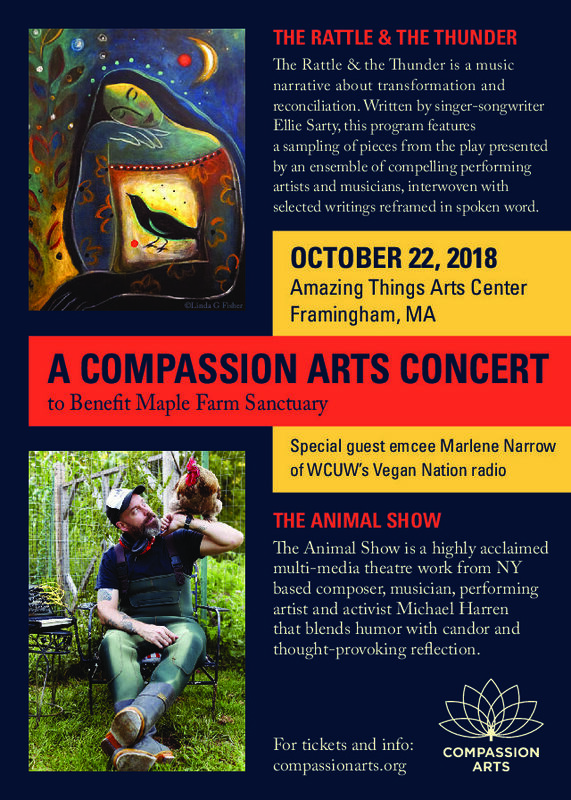 Michael Harren is an animal advocate, composer, musician, and recording artist who has performed extensively across the US and at renowned venues such as Symphony Space, Joe’s Pub and Moogfest, among others. He is the musical director for Cabaret for a Cause and toured as pianist for Sandra Bernhard. His play, “The Animal Show” has been presented at NYC’s Dixon Theater and on national tour. www.michaelharren.com. Our opening act, “The Rattle & the Thunder” is a musical narrative about personal transformation and reconciliation with the life we share with the planet with. Real life stories and thoughts excerpted from published writings, letters, poems, and interviews from a wide range of both well-known and unknown individuals are reframed in this unique merging of song, spoken word, and interactive musical dialogue to create a new multi-arts play by singer-songwriter Ellie Sarty in development with Compassion Arts ensemble’s Alfee Westgrove, Donald Vincent, and supporting musicians. Selected songs being performed at this event are set for album release Dec 2018. www.compassionarts.org.